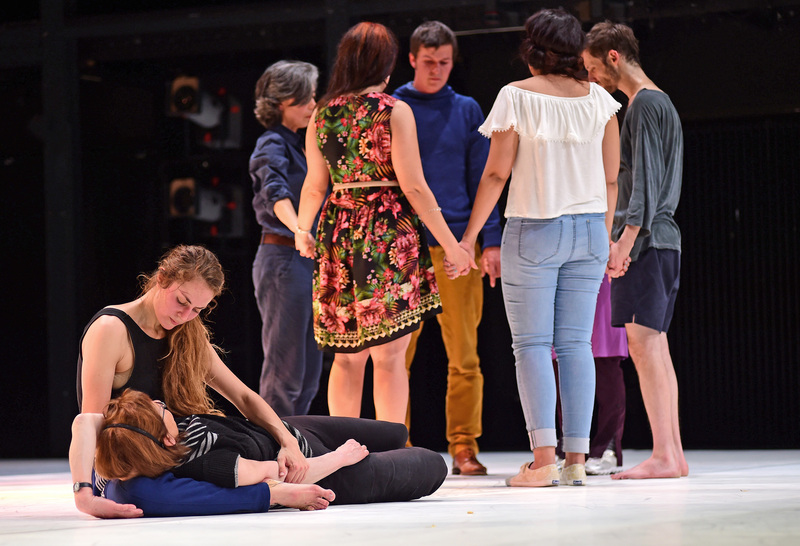 After a work-in-progress-showing of Yasmeen Godder’s new creation „Common Emotions“ at the final conference in December 2015 it was now presented as world premiere at the Tanz und Theater Festival Freiburg in May 2016. In my last creation, called “Climax”, I was commissioned by a museum to make a piece and I decided to place it in a space without deciding for the audience where and how to view it. The performers and I discovered that this proposal had a lot of different impacts or influences on the way people experienced the choreography, experienced themselves, their bodies and the space. And the dancers’ role also changed: They became agents rather than just people who present themselves or perform, they became agents in a space that create possibilities for the viewer. Through the performances we collected more knowledge about how to communicate with the audience not in a traditional sense of “you look at me and I am in the light and you in the dark”, but how to communicate through the body, through nuances, how move people throughout the space without talking, how to tap into their curiousity and to use it to develop a much more active spectatorship, one which makes them more aware of how they are choosing to participate in the work. Following this experience with “Climax” which shook my creative world, I felt that I can’t make another frontal piece for the stage, without using and continuing to develop this acquired knowledge. I wanted to keep on exploring the role of the audience in a performative situation and so that’s one reason why I decided to structure „Common Emotions“ in this interactive way. The „Störung/Hafraah“ project really influenced how I see my dance making by simply opening the door of my studio to different people and communities and dancing together in a common space. This kind of unexpected intimate meeting in the studio – through the body, through different methodologies of movement and improvisation – created a drive for me to bring this exact thing onto the stage and propose it in real time in a performative environment. In “Climax” I always feel that a community is build by the end of the show, the public interacted, they noticed each other in intimate moments, some boundaries which may separate them when the show begins are slowly broken and a group is formed– consciously and subconsciously. In “Common Emotions” I wanted to tap into that, into how we become groups, by proposing different kinds of tasks or actions which could connect us into groups and into experiencing together. My research theme within „Störung/Hafraah“ was unison. 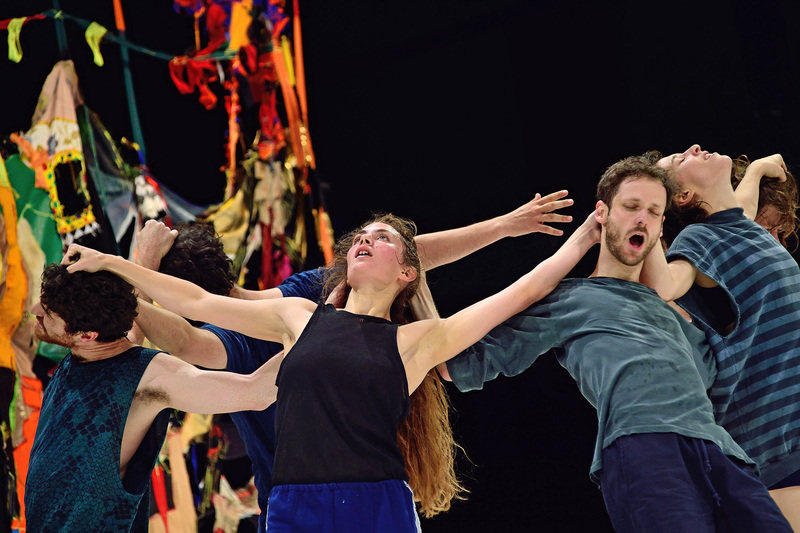 As a choreographer I have never been a big fan of unison, I was scared of it , I didn’t like it – as it had a variety of references which were conceptually challenging for me. So one of the things I wanted to explore during the process, is the possibility of unison and how it plays out on differently, for example an emotional unison, a physical unison or a unison that is not visible, a unison that is felt and not seen. The music came in very early in the process. The first two pieces are Holst “The Planets” and the third one is Strauss’ „Methamorphose“. Choosing Holst came as a result of an interaction with a junior scientist: We did a mini-experiment in the studio and the scientist Hila Gvirts divided us into two different groups. She gave each group different sentences to read and played each group a different piece of music. Afterwards she separated us into duets and asked that we will do a mirroring improvisation with someone from the second group, and at the end we responded to questionnaires in regards to this experience. A bunch of the dancers where in the “neutral” control group and she put on Holst. She picked this piece of music from a scientific paper which suggested to use it as a “neutral” stimulus. I was really drawn to this experiment and to the music. Sitting together in a group of people, reading a text like a mantra, and listening to Holst together was very inspiring for me. The curtain on stage – designed by Gili Avissar – reminds one of a traditional hand -sawn quilt or a community blankets. This was the starting point for my meeting with Gili – I thought of the communal experience that I was trying to bring forth in this piece and at the same time finding a way to break up the stage space into other environments. From there the curtain opened up a whole universe, which was more about creating an intuitive place, a place that is less academic and conceptual, and more about fantasy, a place that we don’t understand, a place that is too wired and complex to put it in one emotion. Everything else in the piece attempts to be very thought out and structured. And I feel the curtain and its proposals were an exciting way to break away from a very heady place. When you are talking about gathering and communicating and about common emotions, there is also the connection to ceremony, and to a place of losing control within an enivromen of control. That’s another way in which Gili’s visual world connects to the themes I wanted to research. What makes us participate in a social ceremony? How does the performance, as a social ceremony, impact the way we relate to each other? What determines our involvement in it and what control do we have over our emotional self during this act? Six performers – Shuli Enosh, Dor Frank, Ayala Frenkel, Uri Shafir, Ari Teperberg and Ofir Yudilevitch – share the stage with guests from the audience, blending and mixing the formal separation between performative space and the spectators’ seats. 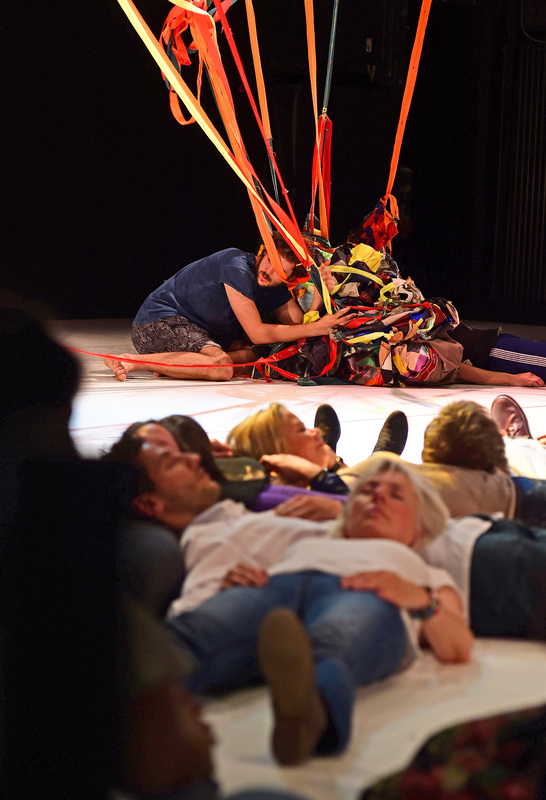 Adding a new secretive communal zone, behind the back curtain, the audience and the performers interact and exchange with each other, as they attempt to explore emotional infectiousness and connectivity. Conveying emotional information via practical workshops the performers share inner unspoken experiences and attempt to charge the audience/guests with ingredients that will boost possible participation and change their viewing position. All of this plays back into the stage, where the performance continues in a developing effort at staying presentational and frontal. Being influenced by her country’s interest in creating a strong emotional narrative that bonds society, Godder is inviting us to a live lab that researches the meaning of participation and its impact on us as individuals and groups. Enabling us to look at it both as an aesthetic phenomenon as well as to experience it through our bodies and senses. 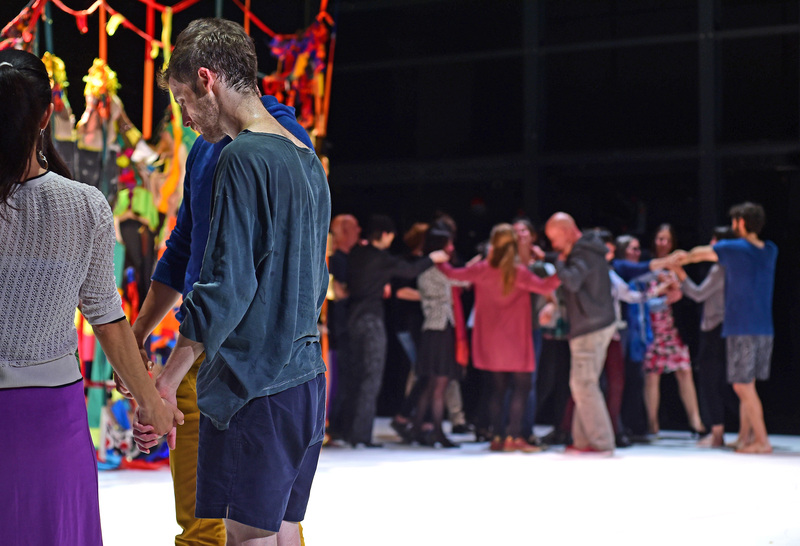 COMMON EMOTIONS is co-produced by Theater Freiburg (Germany), Centre chorégraphique national de Rillieux-la-Pape (France), director Yuval Pick, and The Diver Festival (Israel).